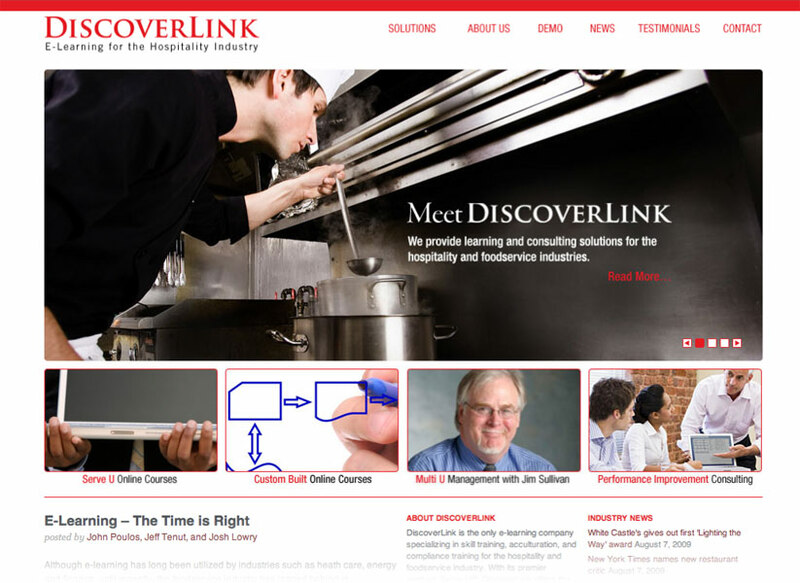 Design and develop the web site for an e-learning firm specializing in the foodservice and hospitality industry. The site must establish an online presence commensurate with the company’s high level of expertise and substantial industry footprint. It must also enable the dissemination of company-developed research and company information to their vertical markets, with minimal technical support. The site design presents a clean and conservative face, visually appealing while exuding efficiency and competence. The main page emphasizes the people-centered nature of the company’s work, with large, eye-catching images inviting potential clients to explore the detailed information provided in the interior. Highly relevant content on the homepage also provides a strong SEO profile. A Wordpress-based content management system provides a simple, user-oriented interface for client-produced updates. Design a highly interactive and visual method of conveying the complex interdependencies within corporate work flows and their relationships to formal organizational structures. The package is to provide decision makers and analysts a holistic view of the functional and organizational structure while providing fine-grained details in examining specific relationships within the processes. The package must be easily adaptable to any organization and process. The Flash- and xml-based application enables flexible adaptation to widely varying client organizations and processes. The user interface permits intuitive, fluid zooming in and out of the map while retaining context within the overall structure. Detailed information is available interactively within each node. 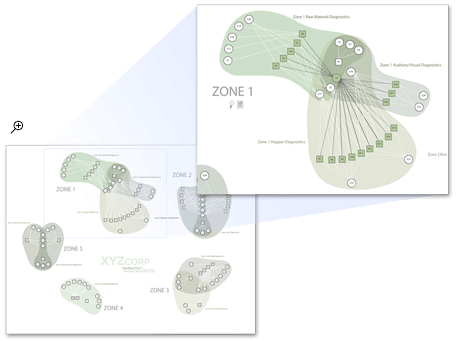 Organic shapes were specifically chosen to contrast the nature of this visualization (based on the actual connections used in practice) to the often idealized and artificial geometry of an org chart. The system’s unique and proprietary capabilities resulted in a US Patent application. 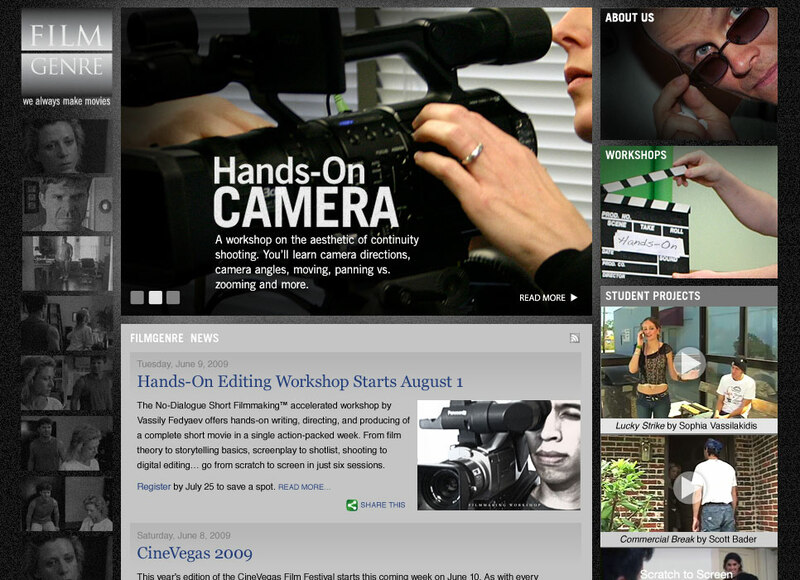 Refresh a web site for a company that conducts workshops in filmmaking. The target audience consists largely of first-time to intermediate hobbyists learning traditional filmmaking concepts and production skills. The company conducts several different, periodic workshops that change over time, requiring a strategy for easily updatable promotions. The goal of the site design is to affirm the reader’s desire to create films and to engage more deeply with the process and philosophy of filmmaking. The darkened background with a central glowing rectangle containing highly-visual content evokes the movie-watching experience. Modular content such as the news postings and navigation links elsewhere on the page are presented in sometimes-subtle, sometimes-literal evocations of a frame, the fundamental unit of film. 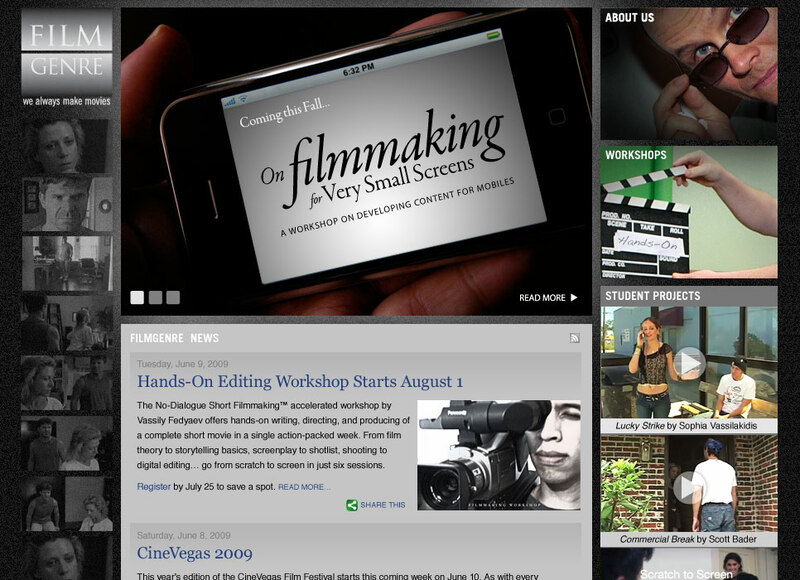 The top rectangle presents a dynamic, high-attention and easily updated space for promoting individual workshops. The right strip affords access to interior content as well as opportunities to watch actual films produced by the workshop’s students.